after various Manorial Lords is – and was – a quintessential English village with roots going back to the early Middle Ages. Never a large village – the population in 1279 was recorded as 50. 20 villeins – 2 cottagers – and 28 free tenants. However, many centuries later in the landmark 1911 national census, the population of South Newington was still only 222 and the year before Margaret Thatcher became Prime Minister (1978), the population of the village was still below 250. For such a small village, it had considerable external interest. No fewer than four Manors – all with their own dynastic and family connections and commitments. Starting with Odo of Bayeux. The Manorial histories are full of over-Lordships, escheated, tenants and remainders, tithes and yardlands of glebes. Ownership by Abbeys, such as at Eynsham, estates owned by Magdalen College and then Exeter. Land held by St John’s Hospital in Oxford and even a walk-on part by Cardinal Pole. It was of course Cardinal Pole who as Archbishop of Canterbury was formally responsible for annulment of the Aragon marriage. The history of South Newington’s Manors reads like a rather complicated question in a Bar Final examination on English Land Law. Perhaps all these external interests were due to the richness of South Newington’s soil with medieval field names such as Peasbreach, Beanland and Barley and Oatshills. Perhaps that explains why such a comparatively small village with such a small population managed to build this very fine Church starting in the late 12th century. There must have been a benefactor who in the mid 14th century caused the inside the Church to be painted. Paintings in oil colour on a plaster surface – a rare method in the mid 14th century – the style closely resembled to that of miniature painting. The illustrations were religious including a Madonna and Child, and a Doom, there were also examples of contemporary history including the Martyrdom of Thomas of Lancaster and there were also a Heraldic record of armorial bearings of local families, such as the Chesneys, Giffards and Morteyns. Perhaps the benefactor of these wall paintings was Richard of Hunsingore – an early Rector of this Church and like many subsequent Rectors, non-resident – living in Oxford where he was a considerable property owner. The dates would fit – Richard of Hunsingore died in 1337 – he was buried here in this Church and provided money for Masses for his Soul to be said here. Come the marriage of Henry VIII to Anne Boleyn. Come Thomas Cromwell and his men. All of these medieval wall paintings were painted over and covered up. South Newington Church has always tended to reflect the way the wind has been blowing at Whitehall and at Lambeth Palace – and indeed come the arrival of Mary Tudor on the Throne – almost immediately the Church Wardens here bought new vestments, a cope and a manual to re-equip this Church for Roman Catholic Worship but no attempt was made to reveal the medieval wall paintings which, of course, people at that time would still have known to have existed. Mary’s reign was short. And come Elizabeth to the Throne things here change again. The Altar Stone here was removed and two years later the stone bases for the statues were pulled down. Throughout the centuries – as now – this Church has had regular major repairs. A whole series of repairs in the early 1820s, including the wall of the nave and the chancel being repaired – the latter at the Vicar’s expense – and a ceiling in “Carpenters Gothic” style being inserted in the chancel roof. But it was in 1893 during restoration that the mid 14th century wall paintings were discovered and then later in 1931, a series of late 15th or early 16th century paintings depicting scenes from the Passion were discovered on the nave walls. These wall paintings created a stir. Indeed South Newington Parish Council minutes of 1950 record that the Parish Council asked that new Council houses be built of stone because the village attracted many visitors, particularly to see the wall paintings in the Church. Of all the wall paintings – perhaps now the most memorable – is that of the Virgin Mary and Child. Now regularly to be found on Christmas cards and notelets. 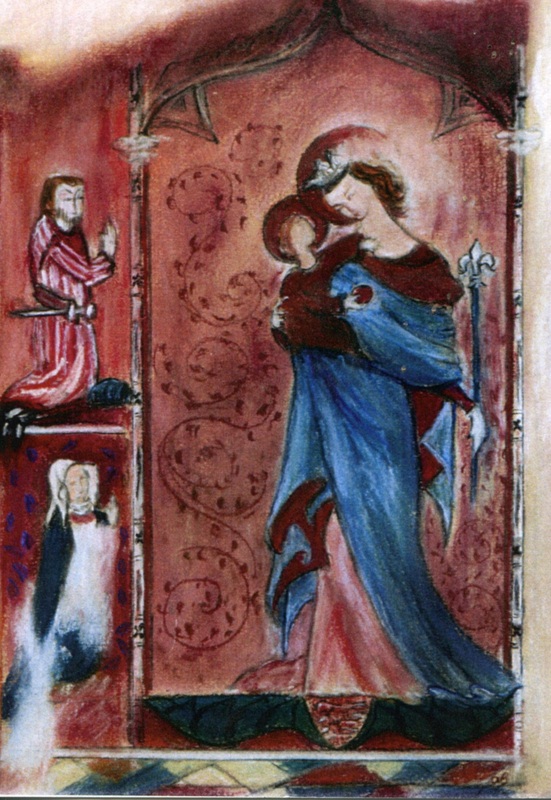 This Mary and Child – apart from being a very fine piece of medieval art – also symbolises something of the history of the Church of and in England. Why was she covered up? These fine medieval wall paintings got caught up in a doctrinal dispute on intercession. to intercede on my behalf. 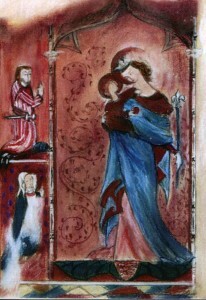 Today we are much more tolerant of diversity within the Church of England and it is therefore entirely consistent that the Church should possess and display a very fine medieval Madonna capable of being venerated which clearly would have and did offend the sensibilities of the likes of Cranmer and the authors of the 39 Articles of Religion. We are here today to mark a successful fund-raising campaign and to thank each and every one who generously donated to the funding of the recent restoration. It is consistent with centuries of stewardship of this Church by a comparatively small numbers of villagers throughout the centuries. This is, of course, in part about cherishing a key part of the heritage of this village. It is in part about conserving and cherishing Christian witness in this community but the medieval wall paintings, particularly allow this Church to be a living record of something of the history of the Church of England and the Church in England. It is not surprising that when the Royalists were in ascendancy at Whitehall and Charles I was on the throne that this Parish had a Royalist incumbent. The history of St Peter ad Vincula South Newington has been a reflection of the history of the Church in England. And with your help, long may this Church continue to do so – and I hope that many people will come to see the wall paintings here and also to celebrate centuries of witness to the Church and Christianity by this village. “South Newington. it is save for us something of the beauty of medieval England. Its fine Church has the unspoilt loveliness of work left by builders from Norman to Tudor days and there has come to light in our time on its walls a remarkable gallery of 14th century paintings …the fine Tudor door has a King and a Queen on its arch. From Norman days comes the font with a zigzag band round the bowl and two bays in the north arcade. The rest of the arch is 13th century. The chancel is mainly 14th century. The clerestory is 15th century. The chancel has four roundels of old glass with the signs of the evangelists and there are a few fragments in black and gold in one of the aisles. This shows birds and animals and two men’s heads. We found here hanging on the wall frame forms relating to oaths taken that bodies were buried in nothing but wool. A witness for the days when such burials were ordered to encourage trade. It was in the 14th century that a rare group of craftsmen living in the Banbury district were travelling about painting the walls of Churches. Then some of them carved the grotesques we find round these walls…they were painted about 1360 and have long been covered up with plaster. Much of the pictures has been lost in the scrapings and patchings of the walls and some are so blurred that only the trained eye can read the scene at all. There is much that we can grasp. The crude figure of Christ on the donkey entering Jerusalem through a tiny round arch is one of the most charming remnants of medieval art and the picture of Thomas Beckett is very rich in colour and fine in detail. The figures of the four Knights attacking him are confused but the head of Beckett is perfect in spite of Henry VIII’s order that all trace of him should be blotted out. Here Beckett has fallen on his knees by the Altar and a faithful Priest is trying to shield him. Near the scene is a kneeling man being decapitated by the executioner. It is thought it may be meant for the Martyrdom of John the Baptist who like Beckett was the victim of Royal malice. We are very fortunate being able to enjoy such a beautiful Church.